A very few family sedans can be described as "fun to drive" and Mazda 6 is one of them. The 6's optional 3.7L V6 engine tops most of the family sedans in horsepower and torque. The 6 handles very well and even got the perfect 5-star rollover resistance rating from the NHTSA. The sporty styling makes it stand out from the crowd. Mazda 6 is very roomy and well-equipped. The Interior quality is good too. The trunk is huge (16.6 cu. ft) and the 60/40 split seatbacks fold down flat with the trunk floor. Interestingly, the North American Mazda 6 is longer and wider than the same model sold in other markets. Pre-owner Mazda 6 models are not very expensive. The 6 is fairly reliable and doesn't cost a lot to maintain. Are there any downsides? How is the gas mileage? What are the common problems? Let's take a closer look, starting from the engines. Engine: The 170-hp 2.5-liter inline-4 DOHC is available with a 6-speed manual or 5-speed automatic transmission. Overall, it's a proven reliable workhorse; it's used in many Mazda and Ford vehicles. The 272-hp 3.7-liter V6 comes only with the 6-speed automatic. This engine is also mostly trouble-free. Both the 4-cylinder and V6 engines have a maintenance-free timing chain; there is no timing belt to worry about. Handling and ride: Handling is where the Mazda 6 excels. It holds the road well with minimal body roll in corners. The steering is precise and well-weighted. The ride is firm, but compliant. The 2.5L engine is overall a decent performer and pulls lively off the line. The 3.7L V6 is very strong. The 0-to-60 time for the V6 is just over 6.0 seconds. The V6 Mazda 6 feels very solid and exceptionally stable on the road. On the downside, some road and tire noise are noticeable. Safety: Anti-lock brakes (ABS) and stability control (DSC) are standard. Late models offer an optional Blind Spot Monitoring system that warns the driver about vehicles approaching from the rear to the left and right of the car. The 2009 and 2010 Mazda 6 have earned a perfect five-star rating in the NHTSA crash tests, including five stars for rollover resistance. In the new, more rigorous crash tests introduced by the NHTSA from 2011, the 2012 and 2013 Mazda 6 scored 4 stars overall. Reliability and problems: We checked many sources and so far, the 2009-2013 Mazda 6 doesn't really have that many problems. 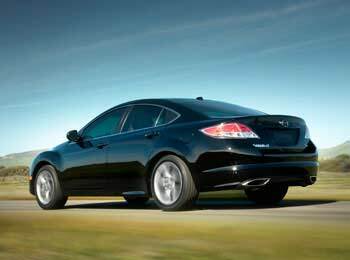 Consumer Reports rates the 2009 and newer Mazda 6 'above average' for reliability. Common issues are mostly minor. Many owners report that the front brakes wear fast. Corrosion at the battery terminals can cause some electrical issues. There are some reports about minor issues with the push-button start system where a faulty keyless remote transmitter may cause intermittent no-start condition. A faulty purge valve can cause the check engine light to come on. Several owners mentioned that the dashboard material becomes very soft and 'melts' on hot sunny days. Fuel economy: The 4-cylinder Mazda 6 gas mileage is about average for the class. With a 2.5L 4-cylinder engine and an automatic transmission Mazda 6 gets up to 444 miles (710 km) on a 18.5-gallon tank (70 liters). The V6 is even thirstier. See the table. Pros: Sporty styling, handling, above-average reliability, interior space, large trunk, powerful optional V6, reasonable price on the used car market, easy to modify. Cons: Average fuel economy, seats are pretty firm, road noise, front brakes wear fast. 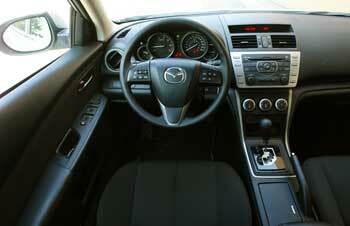 Overall: If you want a used family sedan that is roomy, reliable and fun to drive, Mazda 6 is a good match. Don't miss out on the V6 Mazda 6 if you want a lot of power. Added weight of the V6 engine also provides better traction on snowy and icy roads. An extended warranty may offer a peace of mind in case something goes wrong. Similar cars: Competitors include Toyota Camry, Nissan Altima, Honda Accord, Chevrolet Malibu, Ford Fusion and Hyundai Sonata. The Camry is more reliable and is known for its very comfortable and quiet ride. It also offers better highway gas mileage. Nissan Altima handles well too and gets better city gas mileage, but it's a bit smaller. Honda Accord is an overall excellent car, but it's priced a bit higher. Chevrolet Malibu is also better on gas; it handles well and rides comfortably, but the reliability is not better than average. What to look for when buying a used Mazda 6: It's a good idea to check the history report to avoid cars that have been previously flooded or damaged. Check if all the electrical accessories work. Watch out for rust at the bottom of the doors (on the inner side) and underneath the car. If you can arrange for the pre-purchase inspection in the shop, ask to check the vehicle underneath for rust, oil leaks and other problems. In the Rust Belt, there is a risk of expensive rust damage to chassis components. Test the controls on the steering, audio system, power locks and the air conditioner. See if the driver's seat is comfortable. When checking under the hood, see if the battery terminals are not corroded. Check the oil level and condition; low oil level may indicate that the engine consumes oil. Avoid the car if there is blue smoke from the exhaust. During the test drive, see if the car holds the road well and doesn't pull to one side or another. See if the transmission shifts smoothly. Read more what to look for when buying a used car. 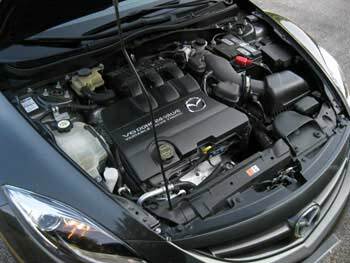 Maintenance: For US and Canada, Mazda recommends using 0W-20 synthetic oil in the 2011 and newer 4-cylinder models. Tires will last longer if rotated regularly; radial and directional tires are rotated front to rear on the same side. Radial tires have the letter “R” in the tire size; for example, P215/55 R17 are radial tires. When you have your oil change done, ask to check the battery terminals. In some cars, the electrolyte leaking out from the battery can damage the battery cable, which is expensive to replace. A cabin air filter needs to be replaced every 2 years or 25,000 miles (40,000 km). Have your brakes checked regularly, as the front brakes are known to wear prematurely.